Community Preservation Committee: Councilor Flaherty reported back on May 15th's working session on the creation of the Community Preservation Committee. State law requires that after communities opt in to the CPA, the local legislative body passes an ordinance to define the composition and procedures of the committee that will make recommendations on how to allocate CPA funds. This ordinance proposes a committee of 5 members appointed by the Mayor (heads of various agencies/commissions that oversee affordable housing, parks and open space, and historic preservation as statutorily defined) and 4 appointed by the City Council, serving staggered 3 year terms. The group would be responsible for recommending allocations of expenditures from the Community Preservation Fund, which must be appropriated by vote of the City Council. CPA projects must be related to the acquisition, creation, and preservation of open space, historic preservation, and affordable housing. At the working session, a revised draft that included more specific language on transparency, committee member expertise, and the selection process was reviewed. The Yes for a Better Boston (YBB) Coalition which had led the community mobilization efforts pushing for the ballot initiative had requested that all four Council appointments should come from a list of 12 people that YBB would provide. The Administration also drafted an ordinance that would have the Mayor appoint these seats – 1 from a list created by the Greater Boston Chamber of Commerce, and 3 from a list of 9 from YBB. Councilors expressed concern about allocating seats to specific organizations, given that ordinances will be on the books for years to come and the composition and leadership of organizations can change. Our proposal is for the Council to create a subcommittee to oversee the selection process (through an open application portal on the City website that could include support letters from organizations) and hear recommendations from the CPA Committee on allocation. Councilor Flaherty also mentioned that there was some discussion on whether the Council needed to formalize the committee structure by June 1st in order for the City to begin collecting and potentially disbursing the funds in this fiscal year; if that is the case, we would have to vote on the ordinance at next week’s meeting. The matter remains in the Committee on Government Operations. Temporary Protected Status for Haitian Nationals: The Council voted to adopt President Wu's resolution filed in partnership with Councilors Jackson, McCarthy, and Zakim to urge the extension of Temporary Protected Status (TPS) for Haitian nationals. TPS is an emergency immigration status given when people are temporarily unable to safely return to their home country because of ongoing armed conflict, an environmental disaster, or other extraordinary and temporary conditions. The TPS designation allows eligible Haitian nationals to temporarily continue living and working in the United States, and it was granted to Haitian nationals who were in the US as of January 12, 2010, the date of the devastating earthquake in Haiti. The designation has been renewed multiple times, and the latest extension expires July 22, 2017, with a decision due by May 23rd to leave enough time for a 60-day notice period. Legally, the decision should only be based on current conditions in Haiti, and whether people could safely return. We know that Haiti has not yet recovered from the 2010 earthquake and the nation suffers from economic and political crises, rampant Zika and Chikungunya, the effects of a devastating cholera epidemic, and the destructive effects of Hurricane Matthew. However, there have been recent reports that the Trump administration has requested questionable data regarding TPS beneficiaries’ involvement with the criminal justice system and public benefits system, suggesting that they are looking to build a misleading narrative. Several Councilors rose to support extending TPS for Haitian nationals, citing the strong and thriving Haitian American community in the Greater Boston region, which makes up the country’s third-largest Haitian population; nearly 1 out of 10 Haitians living in this area have TPS. May is Haitian Heritage Month, and the City of Boston is proud to be the first city in the nation to formally celebrate Haitian Heritage Month. Council Chamber Accessibility Project: President Wu gave a brief update on the Council Chamber accessibility project, which is proceeding on schedule for renovations this summer beginning in early July and lasting until September. Plans are being finalized to use Faneuil Hall for those summer meetings during construction, except that the space is booked already for the dates of our last two meetings in September, so those dates dates may need to be adjusted or a different location found. As a reminder, the project will lift the Council floor and make our space fully accessible for those with mobility challenges and/or using wheelchairs. Currently, the Council floor is three steps down from the main floor, and the only way down is from a ramp that requires someone in a wheelchair to go all the way around to the back entrance for access. The new plans will mean that no one will have to go around to the back to access the Council floor, and that the Councilors’ entrance and President’s podium will be fully accessible. It will also change a row of public seating to provide wheelchair-accessible seating (currently nonexistent). The improvements will also include sound treatments on some of the walls to help attendees hear better, LED lights that will save energy and provide adequate lighting on one side of the Chamber that is currently dark, and new carpeting in the form of carpet tiles that are easier to clean and overall more cost-effective to maintain. Pregnant Workers Fairness Act: The Council voted to pass Councilor Pressley’s resolution supporting the Pregnant Workers Fairness Act proposed at the state level, which would protect women needing reasonable accommodations during and after pregnancy. The City of Boston already has these protections in place. Councilor Campbell and I, both expecting this summer, were especially eager to support! The Fort Point Neighborhood Association is proud to have Massachusetts Fallen Heroes as a sponsor of Fort Point's Love Your Block. On Saturday May 20, 2017, the kick-off Patriot Week (May 20 -May 29, 2017), Fort Point residents gathered to volunteer and to salute our veterans and honor their sacrifice. Patriot Week kicks off today with the 2nd Annual Patriot Fest Concert at the Lawn on D. Performers include Tyler Farr, Eric Paslay, Dalton and The Sheriffs and Louie Bello. The concert is a celebration of service on Armed Forces Day. Tickets are available for purchase through Ticketmaster.com. Massachusetts Fallen Heroes partners will light up their buildings, schools, and landmarks GOLD to Honor our Fallen during Patriot Week Light It Up Gold campaign. Fort Point partners are the: Boston Convention and Exhibition Center, Atlantic Wharf and the nearby Rose Kennedy Greenway. On Saturday, May 27th there will be a re-dedication of the Memorial & Reception to honor the Fallen at the Massachusetts Iraq and Afghanistan Fallen Heroes memorial at Seaport Common next to District Hall. For a complete listing of events, visit Massachusetts Fallen Heroes Patriot Week. GE held their official ground breaking Monday morning. 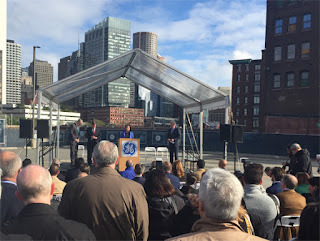 In advance of the groundbreaking GE's Ecosystem Transition Leader, Peter Cavanaugh, spoke to the Fort Point neighborhood at FPNA's April 25th gathering. View presentation. Mr. Cavanaugh explained how GE selected Boston and in particular Fort Point to be the perfect setting for the digital and industrial company. At the neighborhood's request, the rest of the talk focused on the construction of GE Innovation Point. Below are some construction highlights and updates. Once construction begins later this spring, updates will be available at GEReports or you may email or call 617-443-3434. Suffolk Construction will construct the new building. Consigli Construction will rehabilitate the two historic NECCO candy factory buildings. At the meeting the Project work hours were stated to be from 7:00 am to 6:00 pm Monday through Friday. This time range is in accordance with Boston City Ordinances: however, this is in excess of a typical workday. The majority of work on-site will be performed during the hours of 7:00 am to 3:30 pm. There will be work that is performed after 3:30 pm due to logistical or safety reasons. GE will try to limit this work to the extent that possible, specifically any work that is loud. Off-hour and weekend work will be utilized in cases when the Project schedule needs to be maintained or phases of the work need to be performed to minimize impacts to the neighborhood. A schedule of such activities will be provided in advance. The neighborhood raised questions regarding the routes for construction truck traffic. Trucks are needed to remove debris and material excavated or removed from the site, and to deliver new construction materials as the project proceeds. Truck traffic related to this construction site shall vary considerably throughout the construction period. Construction of the General Electric Headquarters is expected to generate an average of 30 trucks per day for the entire construction period. The impact of construction trucks in the evening peak hour is expected to be insignificant because most deliveries are completed prior to the end of the typical construction work day (3:30 PM). Truck activity is expected to be uniformly distributed throughout the work day. Thus, an anticipated average of 30 trucks per day to the site translates to approximately 4 trucks every 1 hour if distributed over an eight-hour work day. Trucks coming to and from the site are required to use major arterial roadways or highways and not local streets. View truck routes approved by BTD. Delivery drivers will be encouraged to use the main roads as much as possible. The number of workers per day will vary as construction proceeds. Over the entire Project construction period, the average number of workers per day will be between approximately 250. Please keep in mind that that this is an average over the life of the Project. As mentioned at the meeting, the location of the construction site makes public transportation very accessible and many workers will use this transit option. The site is convenient to the MBTA’s Red line stop at South Station, and is close to MBTA Bus Stops serviced by the Route 4, 7, 11, 448, 449, 459, SL1, SL2, and SL waterfront. Many commuter rail lines also run through South Station. Suffolk will also provide sufficient and secure storage areas for workers’ equipment to facilitate and encourage the use of the “T”. Any personal vehicles will be restricted from parking at or around the construction site to reduce the impact to residential parking. Due to the proximity of public transit systems, employees will be encouraged to use the MBTA as well as carpooling. Subcontractor parking will be limited to an off-site parking location. GE will encourage the use of public parking lots located away from the project site to ensure a location for on-site workers to park, as well as the local neighborhood. Thank you party at Wormwood Park at 5pm. Stand Up Paddleboard (SUP) Yoga opening weekend at Fort Point Pier (P&G Gillette dock) on Sunday, May 21, 2017 from 11 am - 12:30 pm. Increase focus & concentration. Increase balance & core strength. Connect with nature. Challenge your practice with SUP YO! Limited space. Register. The A Street Park will become the first City Park in Fort Point. All participants will enjoy free coffee and breakfast treats provided by Dunkin' Donuts, fresh fruit from Whole Foods Market and a plant for your family. The proposed project extends the existing South Bay Harbor Trail shared use path behind Gillette to Dorchester Avenue, including Traveler St. and West 4th Street to Albany Road at Union Park Street. The total approximate project length is 0.85 miles. A secure right-of- way is necessary for this project. Acquisitions in fee and permanent or temporary easements may be required. The City of Boston is responsible for acquiring all needed rights in private or public lands. MassDOT’s policy concerning land acquisitions will be discussed at this hearing. 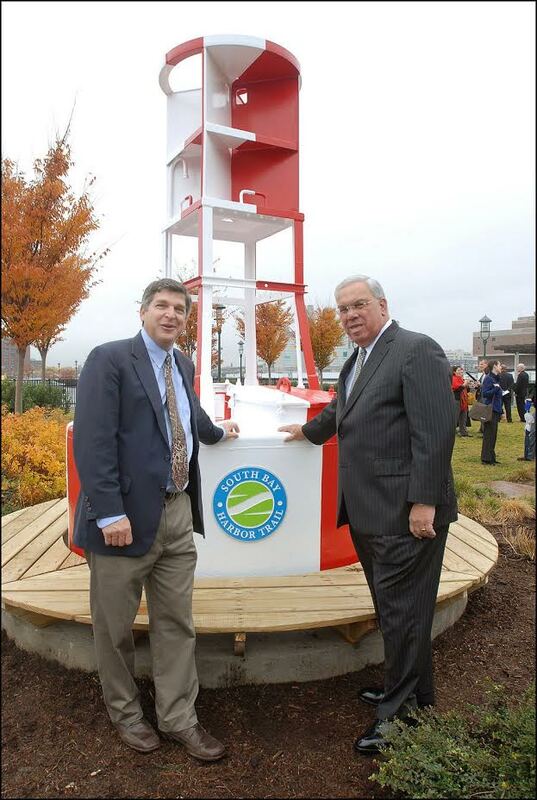 What is happening with the South Bay Harbor Trail Public Art Initiative, wayfinding signage, buoys and historic markers? 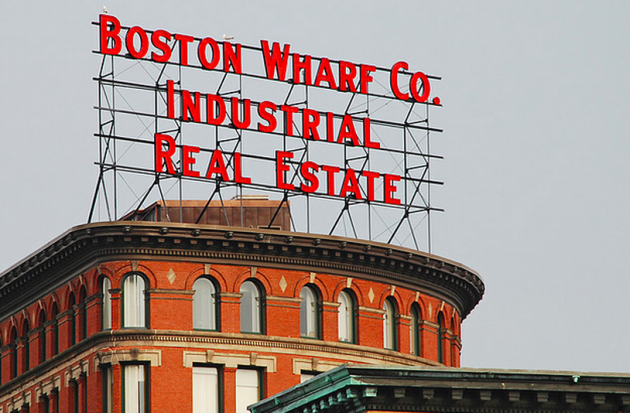 In celebration of historic preservation month, Boston by Foot hosted a special walking tour of Fort Point on Thursday, May 18, 2017 from 6 pm - 7:30 pm. The tour will focus on the Channel itself from how it came to be through the activities of the Boston Wharf Company, South Station development, the Central Artery/Tunnel Project, and recent activation efforts. It will feature the workings of its three remaining historic bridges, plus the memories of the Mt. Washington, the rolling bridges at South Station, and the ambitious cofferdam. The tour starts at James Hook, 440 Atlantic Avenue (corner of Atlantic & Seaport Boulevard). Tickets are $15. More details. Screen Gems is currently in production on a new film Proud Mary. Proud Mary stars Taraji P. Henson (Hidden Figures, Empire) and follows the story of a hit woman whose life is turned upside down when events awaken an undiscovered maternal instinct. Filming will take place on Melcher St. between Summer St. and A St on Wednesday, May 17, 2017 from 7 am to 5 pm. Necco Ct. between Necco St. and A St.
A St. Between Summer St. and Necco St.
Resident are encouraged to check near their cars for posted signs marking exact no parking locations. For example, signs are posted on A Street from Necco St to Wormwood St. If you have any questions or concerns, please contact Stephan Hartman, Locations Department by email or call 617-905-1049. The Screen Gems crew and the Proud Mary cast are excited to film in Fort Point, and it is only through the continued support of neighborhoods like yours, and their local businesses and residents, that the Massachusetts film industry can continue to grow and thrive. 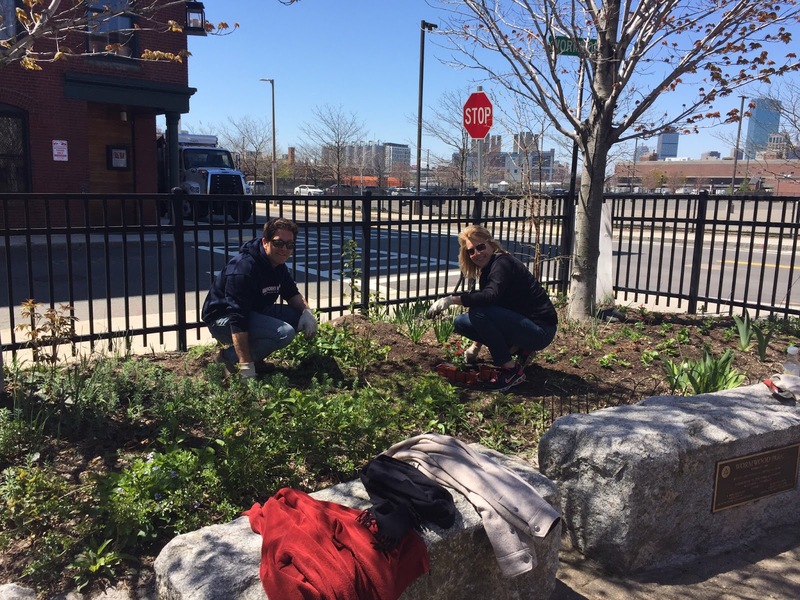 Love Your Block, the spring citywide program to beautify and clean up Boston one block at a time, starts Friday in Fort Point. 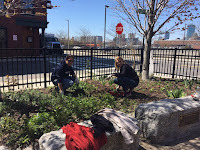 With the continuous support of the City of Boston and Fort Point corporate sponsors, restaurants and volunteers, FPNA is celebrating its thirteenth annual Fort Point beautification event. Employees from over a dozen companies will be volunteering in their work neighborhood planting flowers and designing tree circle gardens along A Street and select tree circle gardens on Congress Street. If you are walking by, you are encouraged to stop and say hello. Sign up and join your neighbors and plant, sweep or rake for an hour or stay all day. Tools, gloves and commemorative t-shirt provided. There will be a Thank You Party in Wormwood Park at 5 pm. New this year the residents at the Artist Building At 300 Summer St will be designing and caring for tree circle gardens in front of their building. If you have tree circles in front of your building that you can adopt (water and weed) all season long, let FPNA know. Proposed Work: Modify Certificate of Design Approval 16.1760FPC by modifying the design of the entryways, adding signage, and install a roof deck at the 7th floor. Proposed Work: Remove two windows on the secondary north facade and install mechanical vents and air intakes. Applicant: Matthew Demers, Stack + Co. Proposed Work: Remove infill at two openings and install mechanical louvers with a dark green finish. Proposed Work: Install freestanding halolit metal signage in the parking lot. 17.1081 FPC 332 Congress Street: Replace the roofing membrane system, and copper gutters and leaders in-kind. l7.932FPC 268 Summer Street: Install metal sign panel within one ground floor opening and a metal blade sign adjacent to the opening ("Jack Conway Realty"), both with external illumination. 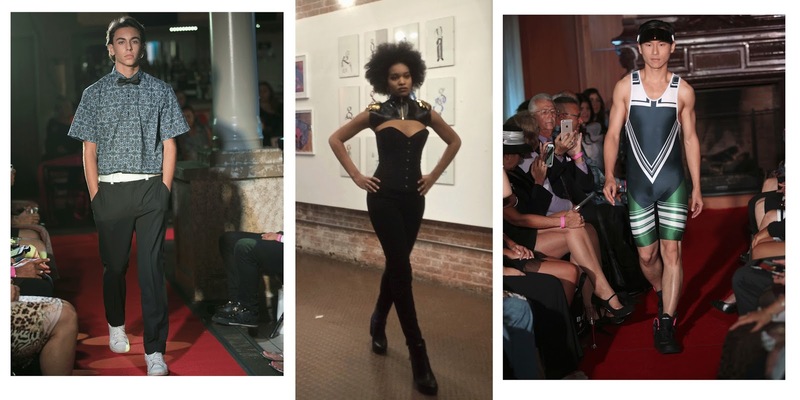 Fort Point artists Dawna Davis, Nathan Evans and Sara Kitaeff curate a fashion experience that showcases sophisticated, unusual and existential designs. The runway show, OUTLOUD, is the grand finale for OUTLAYER, an exhibition of fashion and fashion related art that is off-center and over the line. Shake up your Saturday night with an evening of fashion, art and a runway experience that is out of this world. OUTLOUD is proud to be celebrating their third year of collaboration with Lasell College, Fashion Department (Newton, MA) and with ArtWeek Boston. Fashion designers and artists: Stevie Black,Richard Chase, Nikolay Cherny, Anna Comella, Dawna Davis, Traeger DiPietro, Nathan Evans, Julian De La Garza, Monica Guenard, Lloyd Hall, Lisa Knox, Jessica Linder, Bridget Mackles, Karen McFeaters, Reginald Merome, Silvja Omeri, Adam Pajkowski, Caitlin Redington, Philip Sawyer, Olga Shmuylovich, Souther, Katherine Stevens, Allana Taranto, Sara Tchen-Susman, Tarik Welch and Omari Welch. OUTLOUD is created by Dawna Davis and produced by Syndey Herndon in collaboration with Laselll College Fashion Design and Production Department. Want to get rid of those personal documents taking up unwanted space in your home? Paper shredding is available up to 10 copy paper size boxes or containers. Keep in mind that latex and acrylic paint are NOT hazardous. Just let the paint dry out in the can and put it out on your trash day. View list of accepted items and restricted items. You will need to show proof of Boston residency. Waste can only be dropped off by car. If you have any questions about the drop-off, please contact BOS:311. The purpose of the South Station Expansion project is to expand South Station terminal capacity to meet current and anticipated future commuter rail and intercity rail service needs. The project would also promote city-building in a key area of Boston, and allow Dorchester Avenue to be reopened for public use and enjoyment for the first time in decades. The expansion of South Station would enable growth in passenger rail transportation within the Commonwealth of Massachusetts and along the Northeast Corridor (NEC). In order to use federal funding, the South Station Expansion project is undergoing the federal environmental review process required by the National Environmental Policy Act. The Draft EA and Draft Section 4(f) Determination summarizes the project’s environmental benefits and impacts, and is similar in content to the Draft and the Final Environmental Impact Report (DEIR and FEIR) prepared in compliance with the Massachusetts Environmental Policy Act, filed in October 2014, and June 2016, respectively. To request a copy of the document, please contact Steve Woelfel, Deputy Director, MassDOT Office of Transportation Planning, at steve.woelfel@state.ma.us, or at (857) 368-9800. Comment letters must be received by MassDOT no later than May 27, 2017. For more information about the South Station Expansion project, please visit www.mass.gov/massdot/southstationexpansion. The South Boston Arts Association invites you to a night of music by Hogan's Goat, delicious appetizers, amazing silent auction with lots of original art by local artists*, cash bar and friendly conversation and networking. Tickets are $10 in advance and $15 at the door. Part of the proceeds will be donated to Medicine Wheel and the Young Ambassadors program of the South Boston Health Center. * Art auction application deadline extended to Wednesday, April 26. For info, call 617 464-4237. Art work must be delivered to the SBAA Art Gallery, Arts Around the Corner, at 317 E Street (behind Neatly Nested) on Saturday, 4/29 from 10 am to 4 pm or Sunday 4/30 from Noon to 4 pm.